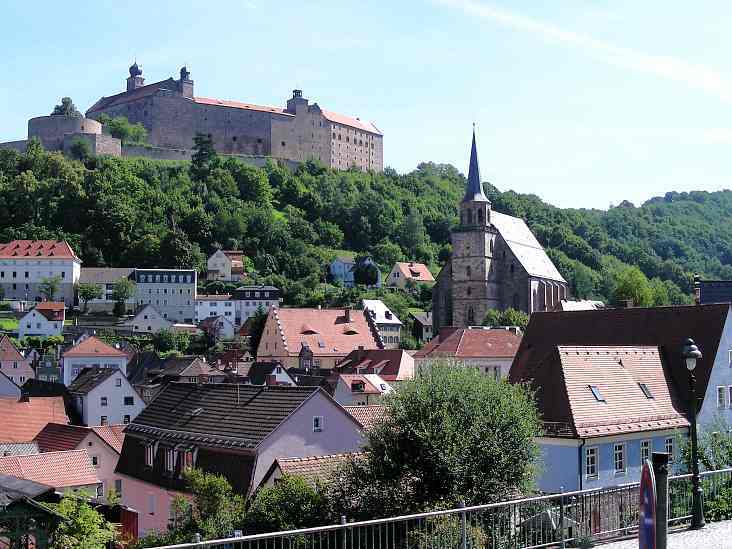 Kulmbach. With castle, of course. 8. August, 2014. The amount of contrast this life affords is astonishing to me. Just a week ago I was drinking champagne, trying to figure out which fork to use in the cafe after the opera. And now I have dirt permanently stuck under my fingernails and have just spent the last eight hours cutting up cucumbers and stuffing them in jars. Wahnsinn. I’m currently in the tiny town of Kulmbach in Bavaria, working on a farm as a part of WWOOF (Worldwide Opportunities on Organic Farms). It’s an exchange program of sorts, where people travel all over the world and work for their keep on farms, gaining skills and networking and learning languages. 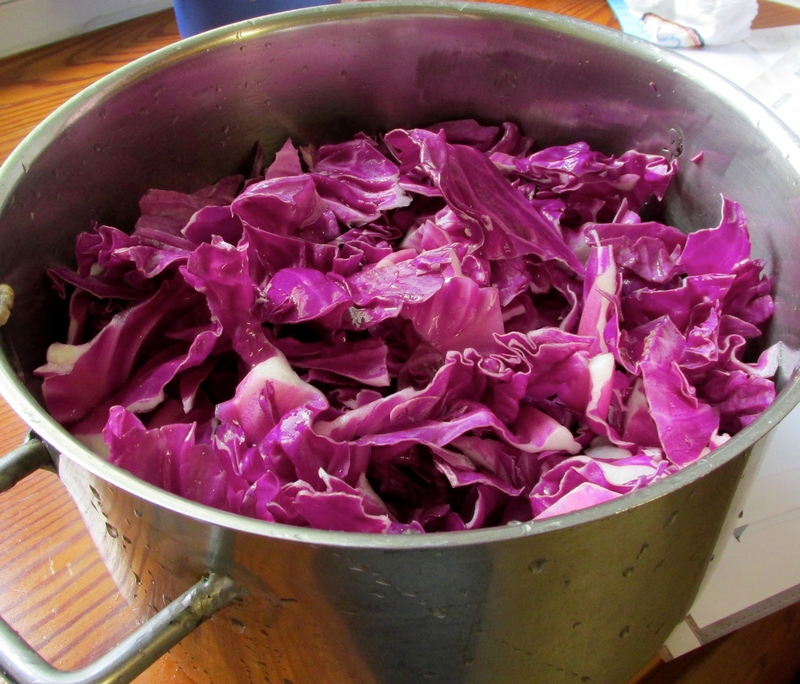 We’ve had WWOOFers on and off at our place for years, and when it works it is an absolutely fantastic experience. The couple I am staying with now spent the last five years WWOOFing themselves, in Japan and Serbia and Africa and Switzerland, and have just begun their own farm. They have a little of everything, and of course too much work to do–huge sprawling garden, orchard with plums and apples and pears, four pigs, fifty chickens, two donkeys, geese, dogs. When they moved in, the barn was falling in from decades of neglect, the garden hadn’t been tended in years, there were no fences or watering systems or cleared trails. They, along with a seemingly constant stream of WWOOFers from around the world, are just starting to take things back. I’m thrilled to be here. I loved my month with the Wuerzburg program–dress up every evening, go to concerts and modern art museums, talk about Musil and Nietzsche while drinking wine on some gorgeous terrace somewhere, be refined and intellectual and decadent. 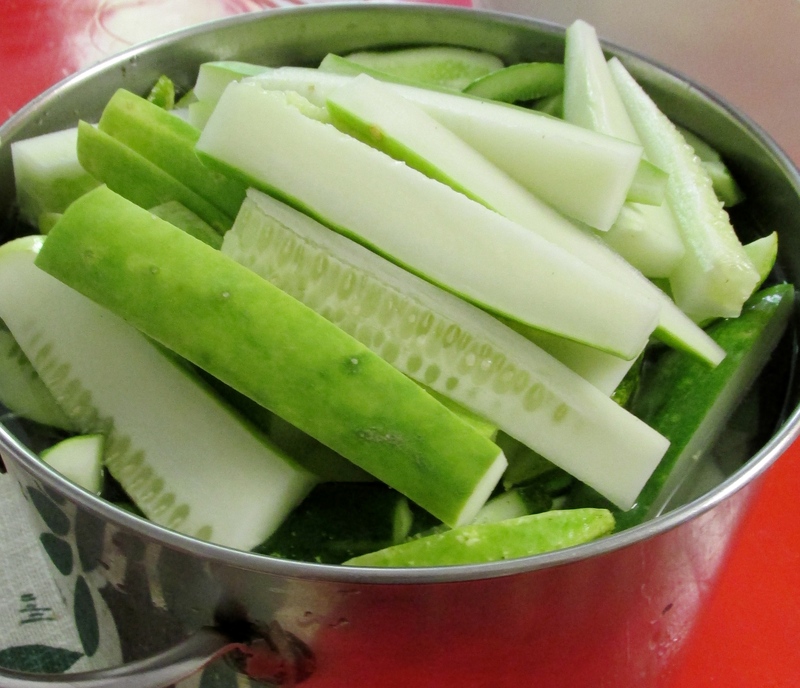 But I love this too–dirt and animals everywhere, the electric fencer half taken apart on the kitchen table, neighbors dropping in with a basket of dill to talk in broad dialect about the excess of cucumbers. And honestly, it’s what I know best. I’ve spent my Augusts in a farm kitchen since before I could walk. I can snap beans in my sleep. Heinrich and Henrietta, plus a friend. Animals that have names don’t get eaten. Differences in atmosphere aside, though, here there is still this internationality that I find so staggering. Right now, we are four or five countries all together, all with drastically different worldviews and upbringings. That’s the wonderful thing about good people, though–that somehow it all works out in the end and the household runs smoothly and we have fun. I love the dynamism of it all, the fluid approach to language, where the conversation at dinner flows back and forth between English and High German and Finnish and Bavarian depending on who is trying to make themselves understood. 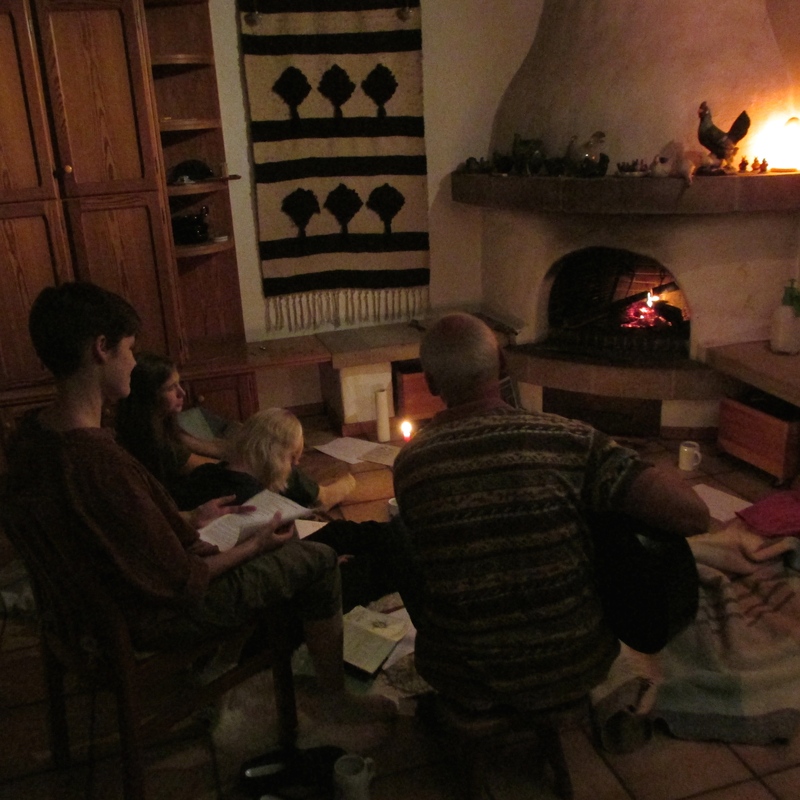 Last night we sat around the fire and sang–I taught them all Irish drinking songs, and learned German folk tunes and a bunch of mournful dirges from Finnland. I explained to my hosts that a cruise and a crusade are not the same thing, and learned the difference between Teig and Teich and Lärche and Lerche. Tricky stuff, that. 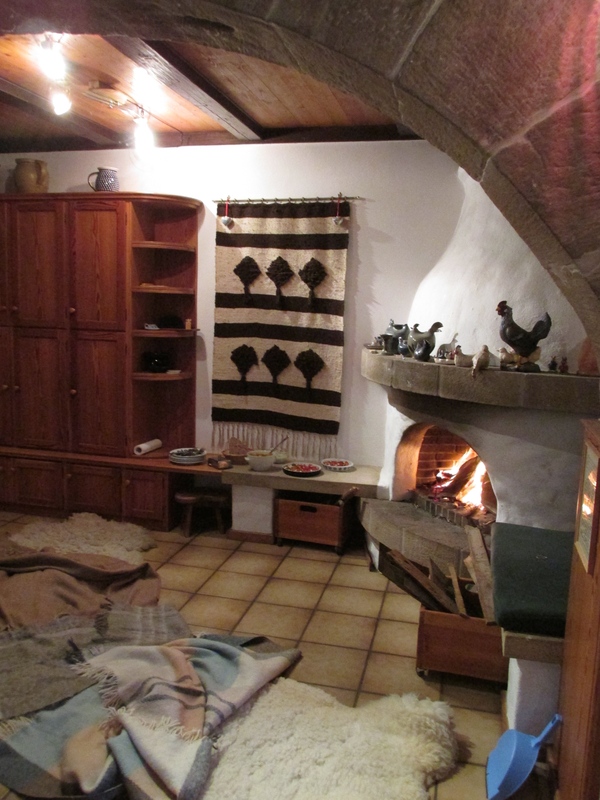 Getting ready for dinner in front of the fire, sitting on sheepskins–eat with your hands. Afterwards, singing until midnight because tomorrow is a rest day and we don’t have to get up early. 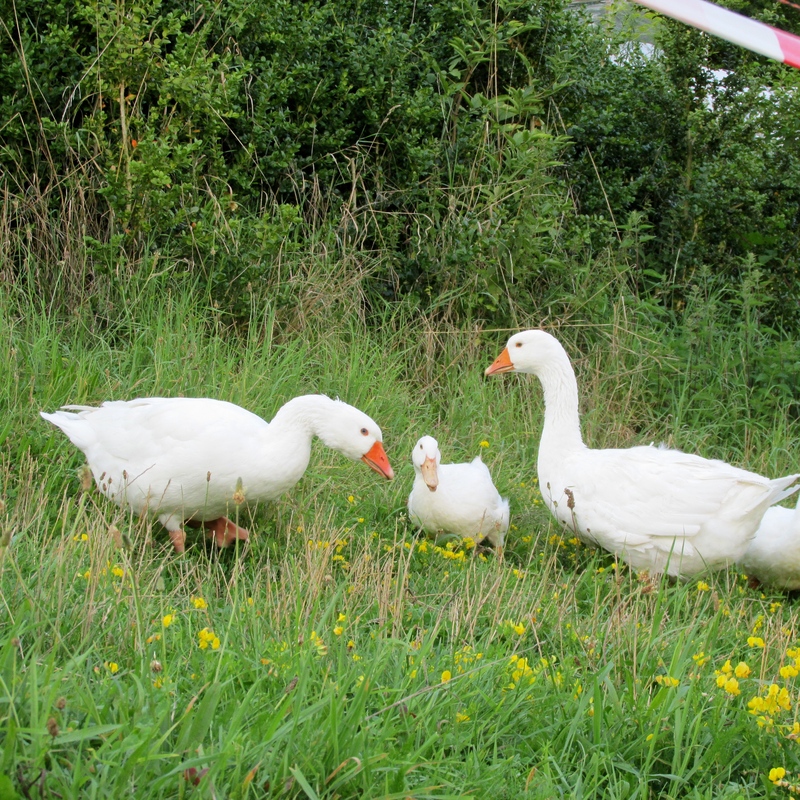 At this time of year on a farm, everything revolves around food. Breakfast is after chores at 8:30, with two loaves of fresh bread (wheat ground on the farm), one with raisins and one with pumpkin seeds–also cheese and pickles and blackberries and juniper syrup in tea. Then everyone leaves and I make 25 pounds of pesto while the bread-and-butter pickles started last night heat up to be canned. At 1pm it’s time for lunch, and the girl from Finnland fries carrots and beets while I make a cucumber salad–yoghurt, fresh mint, salt and pepper. There’s also chocolate zucchini cake and an apple pie with the first of the apples from the orchard. After lunch, someone brings an entire laundry basket of beans in from the garden, and we wash and snap and boil and freeze until 6pm, when it is time to get ready for dinner. 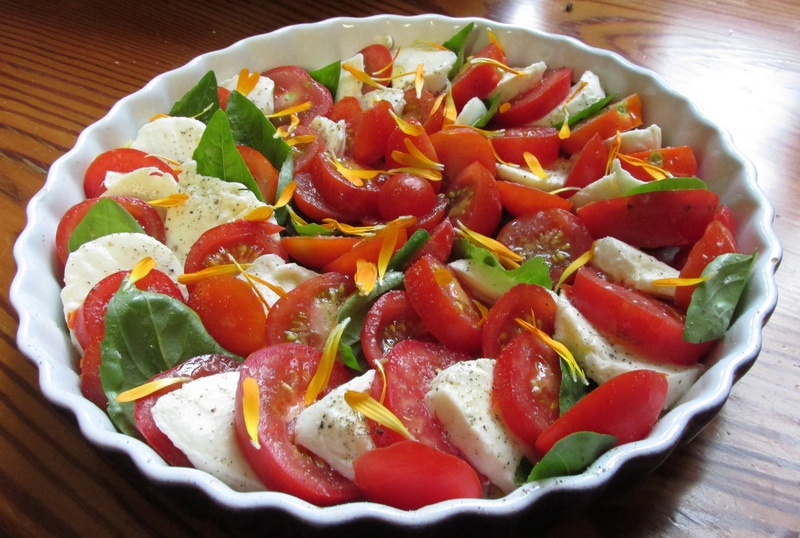 I make two platters of tomato, mozzarella, and basil leaves, with calendula blossoms on top for a garnish. My host’s little brother shows me how to make Zwetschgenknödel for dessert, which are a sort of Austrian plum dumplings and absolutely delicious. We spread a feast in front of the fireplace, and eat the tomatoes with chicken roasted over the flames. Vegetables everywhere–there’s even pumpkins, tomatoes, and basil growing in front of the farmhouse, as if the huge garden out back wasn’t enough. Apple orchard. There’s almost too much fruit for the branches to support. The sheer abundance and richness of it all is staggering. Inside, baskets and barrels and cans upon cans of food, and outside a jungle of greenery and vines and fruit. The Garden of Eden. ….And the infamous Zwetschgenknödel. Suuuuper lecker!!! 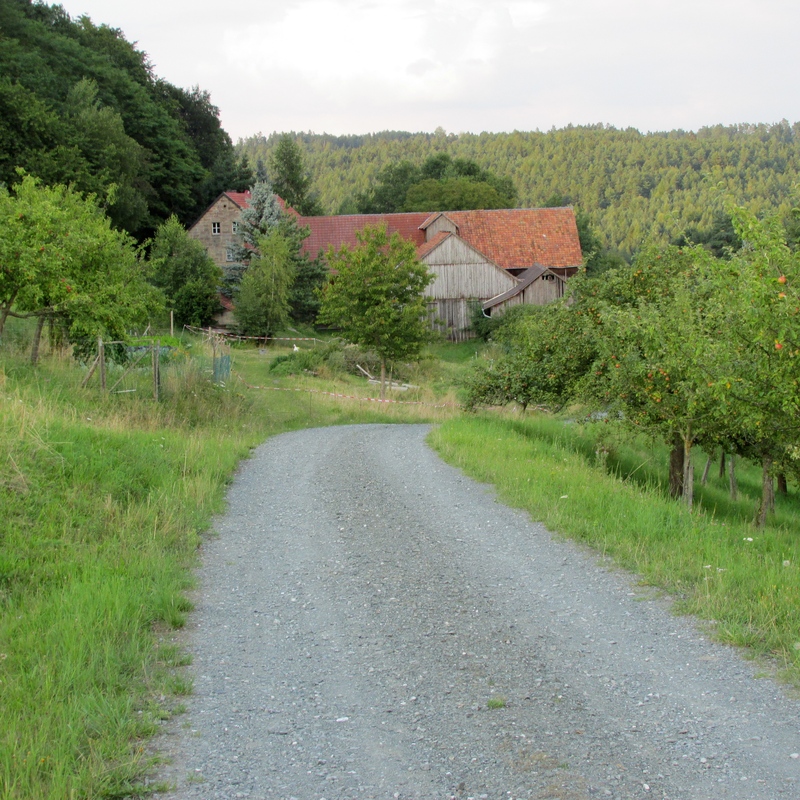 This entry was tagged Deutschland, essen, farm, food, garden, Germany, kitchen, Kulmbach, summer, vermont, WWOOF. Bookmark the permalink. The Zwetschgenknödel looks a lot like the Czech dumplings we made in Krušovice! Yum! So that is what a garden looks like when there are enough hands to tend to it…..always wondered about that. Where is the rust on the broad squash plant leaves? and the millions of squash beetles? Everything so lush and fresh looking and here it is August! They need some sheep to manage the grass out there in that big orchard……oh, and a border collie. Looks wonderful. 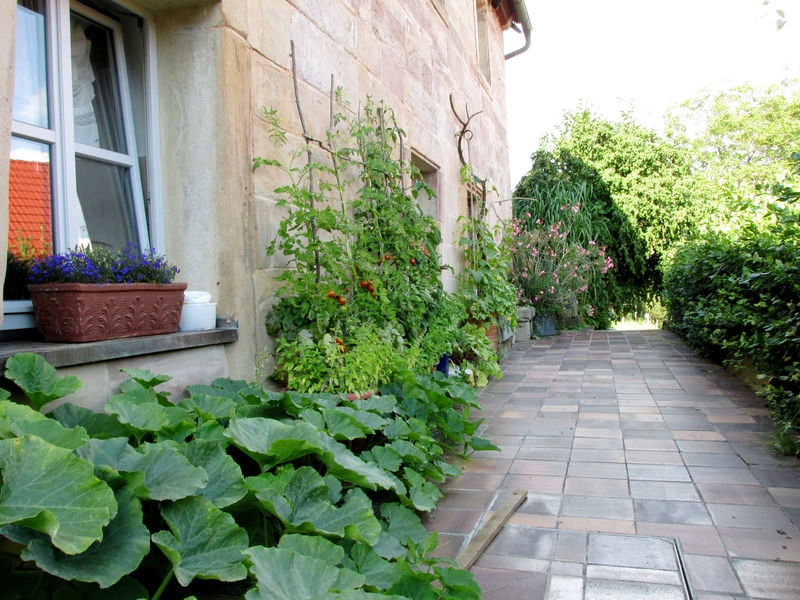 I’m looking at WWOOF Germany right now looking for some great farms. I’ve only wolfed once before in Montana last summer, but am excited to do it again. What’s the name of this farm? It sounds wonderful and I would love to join a community like it during my stay in Germany. I think they are pretty much booked solid for the next few months, but you could always try for next year. 🙂 Good luck! I love your memoirs and beautiful photos! The “plum dumpling” reminds me of ones that George’s mother made every late summer and early fall. (She was Hungarian, born in Budapest, and she came to the US with George’s father in the mid 1920’s…an interesting story that I will have to tell you sometime! ) Anyway, in Hungarian, these plum delicacies are called ” szilvas gumboc”. 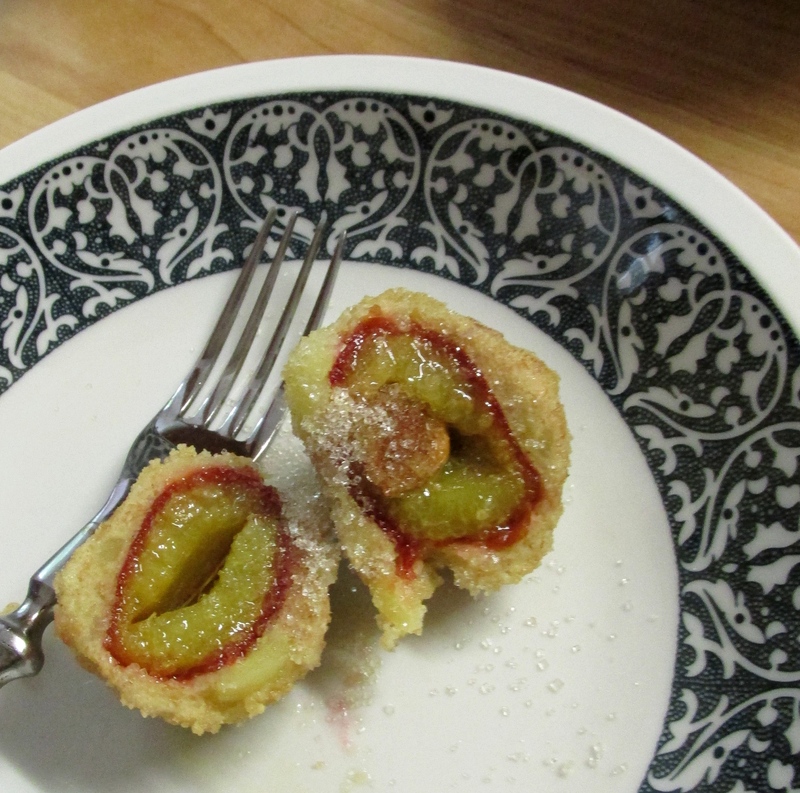 The plums were cut down one side, their seeds removed, and cinnamon sugar was “stuffed” into the seed cavity. The plum was closed and enveloped in a dough that she made out of mashed potatoes mixed with flour. The dumplings were then dropped into boiling water, When the dumplings rose to the top, they were removed, dipped in melted butter, and then rolled in finely crushed bread crumbs that were mixed mixed with cinnamon sugar! At least, this is how I remember them! I tried it a couple times myself, but mine always burst apart in the boiling water! If you make them again, take careful notes for me! It all looks grand, delicious, nurturing and perfect! I’m so happy for you. Love your photos. What do you take them with? They are rich in color and composition. Send some of those plums over (ha!). Have a splendid rest of summer in wonderland. Those evenings by the fire must be absolutely divine.